In 2008 UK coins underwent an extensive redesign, which changed the reverse designs, and some other details, of all coins except the £2. The redesign was the first wholesale change to British coinage since the first decimal coins were introduced in April 1968. 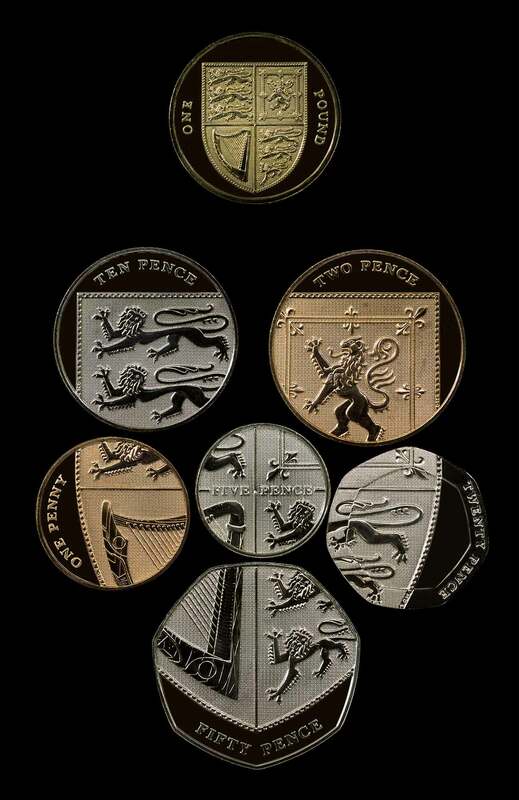 The major feature of the new design is that it is shared across 6 coins (1p, 2p, 5p, 10p, 20p, 50p), that can be pieced together to form the image of the Royal Shield. This was the first time a coin design has featured across multiple coins in this way. Completing the set, the new £1 reverse features the Shield in its entirety. The redesign was the result of a competition launched by the Royal Mint in August 2005, which closed on 14 November 2005. The design competition was open to the public and received over 4,000 entries. The winning entry was unveiled on 2 April 2008, designed by Matthew Dent, 26, from Bangor. The Royal Mint stated the new designs were "reflecting a twenty-first century Britain". An advisor to the Royal Mint described the new coins as "post-modern", something that could not have been done 50 years previously. Andrew Stafford, the chief executive of the Royal Mint, said: "It's the only work of art that every member of the general public touches every day, that is important to the nation's way of life. "We had to make sure that the coin design was true to the heritage of British coins and gave fresh inspiration and modernity to something that has been in existence for 40 years." Quarterly, first and fourth Gules three lions passant gardant in pale Or armed and langued Azure (for England), second quarter Or a lion rampant within a double tressure flory-counter-flory Gules (for Scotland), third quarter Azure a harp Or stringed Argent (for Ireland). The shield is quartered, depicting in the first and fourth quarters the three passant guardant lions of England; in the second, the rampant lion and double tressure fleury-counter-fleury of Scotland; and in the third, a harp for Ireland. The redesign was criticised by some for having no specifically Welsh symbol (such as the Welsh Dragon), because the Royal Shield does not include a specifically Welsh symbol. Wrexham MP Ian Lucas, who was also campaigning to have the Welsh Dragon included on the Union Flag, called the omission "disappointing", and stated that he would be writing to the Queen to request that Royal Standard be changed to include Wales. 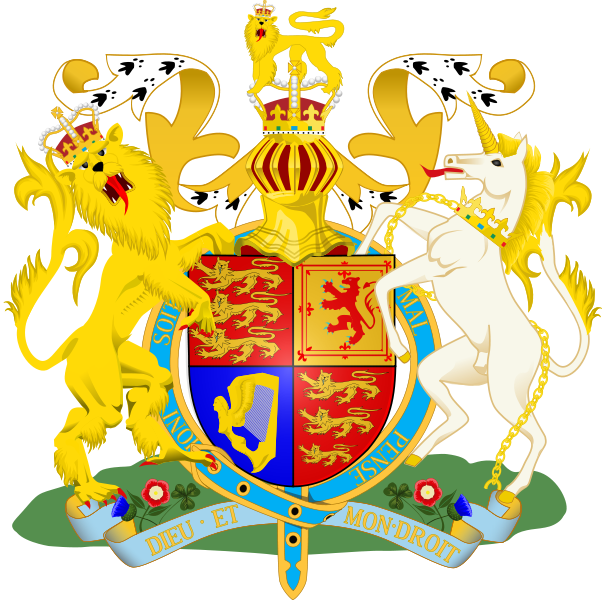 The Royal Mint stated that "the Shield of the Royal Arms is symbolic of the whole of the United Kingdom and as such, represents Wales, Scotland, England and Northern Ireland." Designer Dent stated "I am a Welshman and proud of it, but I never thought about the fact we did not have a dragon or another representation of Wales on the design because as far as I am concerned Wales is represented on the Royal Arms. This was never an issue for me." "I felt it was important to have a theme running through from one to another. I can imagine people playing with them, having them on a tabletop and enjoying them. I would love it if the coins are played with by everyone from kids at school to folks in a pub."